Organic Alfalfa sprouts are what people typically think of when you mention organic sprouts. They are the ones you commonly see at a salad bar. Rich in phytochemicals, organic alfalfa sprouts protect against cancer, heart disease, osteoporosis and fibrocystic breast disease. They stimulate natural killer cell activity, which strengthens the immune system. 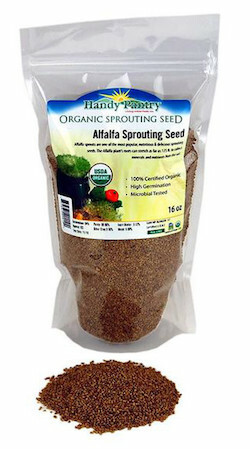 Ingredients: certified organic alfalfa sprouting seeds.